Two very nice solid wood guitars. I used to have a D42SW. I traded it for a Martin. I love my Martin but wished I still had my D42. It was a beautiful guitar. Very unique. You never see them on Ebay. I wonder how many were made. I've seen, this and it's rosewood mate, the D44SW, are the best Korean built Washies out there. I bought a Harvest D44SW back in the 90's. 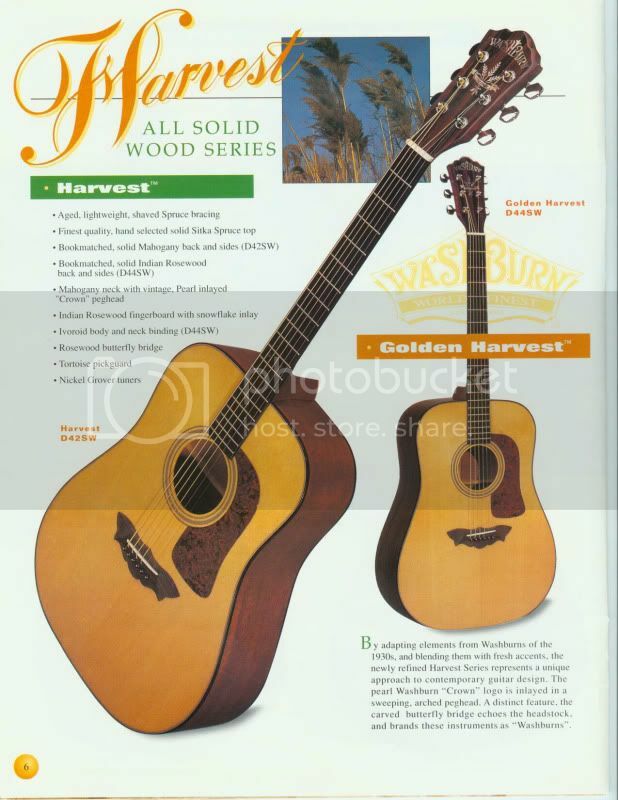 It was my 1st all solid wood guitar. I was so proud of it. Since then I have added a few more solids...a Martin D16, an Epiphone slothead, Martin slothead,a Blueridge, (all solid wood) but I still have that D44 Washburn. It holds its own against those others just fine. Its a keeper. I'm still proud of it. I see you have a D-21S. How do you like it? How would you rate it against a mid priced Martin such as a D1 or DM or even the D-Custom rosewood. I had a Tak F-360-LH that was stolen from a music store in Dallas and they offered me a 1986 D-21SLH which I had to take since there was really no way they would or could replace the Tak. I also own a Martin D-28 so maybe I am being snobby or something but I just do not find the D-21SLH to be very toneful, but like I said, maybe its just a mental thing since I am not a Washburn player and have never owned one before. Thank you for your time. Yes they are solid and perfect budget guitars. Got one for my brother.